With Canadian Thanksgiving just behind us and American Thanksgiving just around the corner, I’m getting tons of questions on how to recover from overeating over the holidays. When we overeat (or undereat!) over long periods of time, our hunger hormones, leptin and ghrelin become overworked and eventually stop working altogether. We all know what it feels like to overeat, and it’s not fun. Overeating can often lead to irritability and mood swings, imbalanced blood sugar, digestive upset and hormonal imbalance. It can also create an unhealthy relationship with food. However, it happens to all of us and today I want to cover some ground rules on how to recover from overeating, especially during the holidays. Don’t worry, resetting after overeating does not mean going on a juice cleanse or starting up a new fad diet. Follow these simple, nutritionist-backed tips for getting back on track! Girl, release that guilt! It’s so important to switch up our mindset after overindulging. Stop and check in with yourself. First things first, let’s stop and take a moment to think about why we overate in the first place. Many of us associate emotions with eating, like eating a tub of ice cream after a bad break up or skipping breakfast if we’re nervous. Today I want to break down those habits and ask ourselves why. Journalling can be helpful, so grab a pen and paper and write it down. Try calling a friend or someone you trust to talk about why this may have happened. Reflecting in a journal or simply meditating on overeating is a good way to check in with yourself. You all know I’m a huge fan of #digestiontalk, so let’s break it down. Our digestion is one of the biggest things to be affected after an episode of over-eating. When we overeat, we tend to spike our blood sugar levels which only results in energy highs and crashes. We also can cause inflammation when overeating. 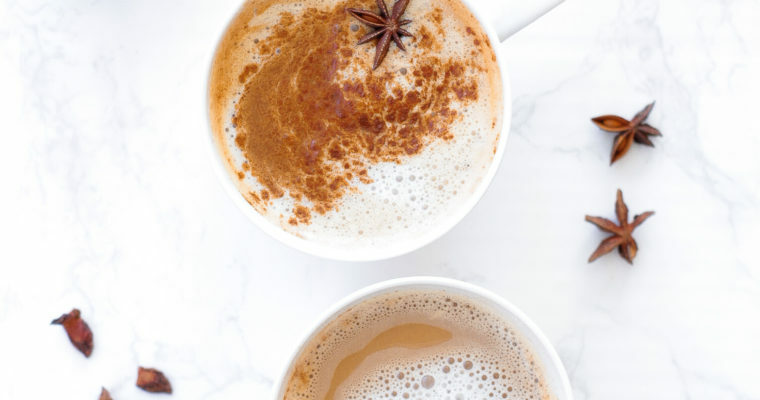 To get our digestion back to functioning optimally, it’s important to give it a little extra love. Our digestive system is the hub where all of our nutrients get absorbed. To heal and restart digestion, sipping on a peppermint or herbal tea after overeating is a wonderful way to help digest your food. Taking digestive enzymes after a meal will help break down undigested foods and help reduce inflammation in the body. Sipping on warm water with lemon will help boost digestion and gently cleanse to help support healthy bowel movements. Focus on digestion-friendly foods like pineapple in cold-pressed juices and smoothies, soft foods like kitchari stew, coconut yoghurt or oatmeal. Let’s look at exercise in a different way. Movement goes hand in hand with healthy eating and can be an amazing way to feel better after overeating. Once fully everything is fully digested, take yourself for a brisk walk or a yoga class. This is a great time to reconnect with nature and breathe in some fresh air. Movement will help increase energy, circulate blood flow, support digestion and so much more. Whether you feel like a long hike or some stretching in your living room, any movement is great! Overeating does not mean you need to overexercise to “compensate”, as some people might believe. Switching up our mindset and moving our bodies to feel good and refreshed is the best mentality to have! Eat these foods to feel better. Including fibre-rich foods will help to bring blood sugar levels back to balance and keep digestion moving. This is especially important if your bowels are irregular – stick up on fibre rich foods. Include foods like bell pepper, broccoli, spinach, berries, pumpkin seeds, oats and banana. For breakfast, opt for a smoothie with pineapple which contains a digestive enzyme called bromelain, spinach, spirulina, hemp protein powder and unsweetened coconut milk. 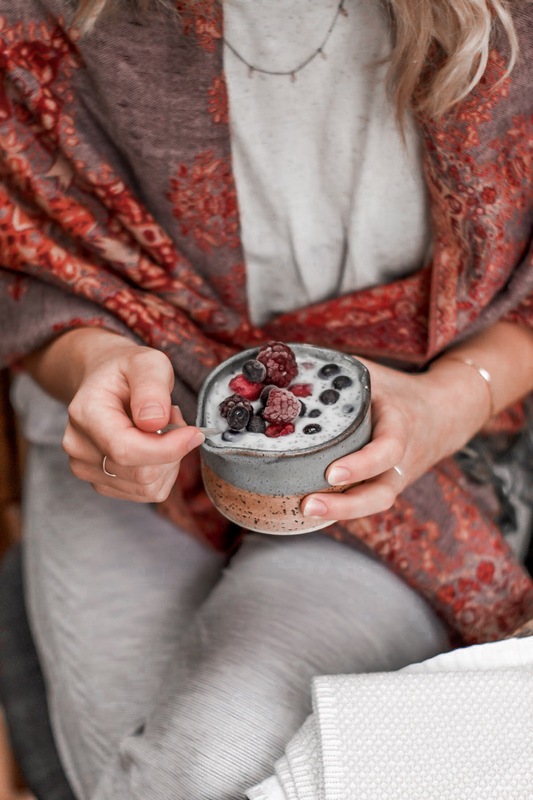 For a snack, try chia pudding with chia seeds, almond milk, cinnamon and berries. 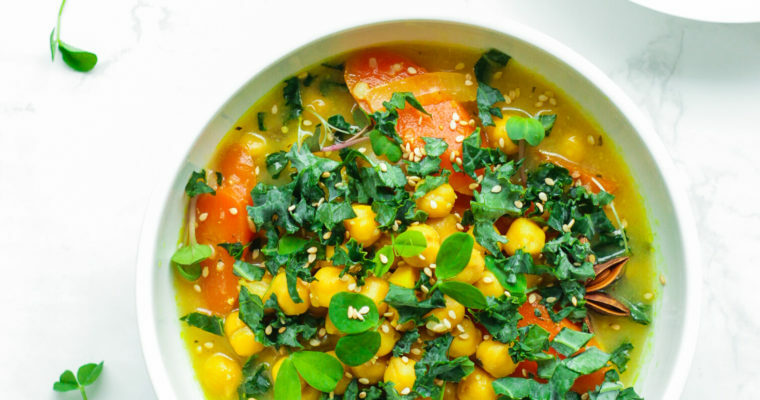 When lunch or dinner hits, opt for a homemade anti-inflammatory turmeric, lemon and veggie soup. Feel excited about water again. It’s super important to rehydrate your body after overeating. Try getting in 2 litres of water throughout the day. Add some lemon juice to help reduce inflammation or a tablespoon of chia seeds to help keep digestion moving. Hydrating will help with energy, mental clarity and digestion. Make sure to avoid drinking water during meals and try to drink a good amount upon rising.